The way it works with TV news shows and anchors is this: A group of writers and producers craft the bulk of the script for the hour or half-hour; the anchors appear on camera and read what has been written for them. The best anchors will write some of their own material. A competent one will go over the script before going on the air and perhaps work with producers or writers to tweak it. One of the fun aspects of TV newswriting is to learn how the talent — the on-air people — read and talk. You learn by trial and error, by writing something that comes out sounding great or something that causes the talent to trip over the words. If you get to write for the same people long enough, the process is a little bit the way I imagine playwriting might be: The anchor or reporter becomes a character; when you write for them, you’re seeing and hearing them speaking the words on stage, as part of a dramatic production. The goal in TV newswriting is short, straight-ahead sentences. They’re easy to read and understand. In my single on-air writing and editing gig, for TechTV’s “Tech Live” daily news show, I had to unlearn my habits of inserting all sorts of clauses and parenthetical comments into sentences. Not because TV news writing is dumber by nature, but because those kinds of sentences are harder to read aloud as they scroll up the teleprompter. Those clauses and asides become invitations to falter when they go from the page to oral delivery. That having been said, you learn which talent can handle a complex thought and sentence structure when it can’t be avoided and which ones can’t. 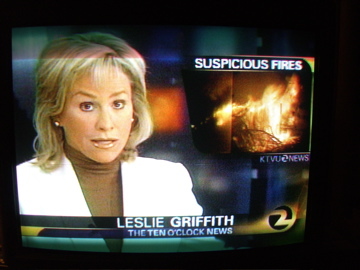 Which brings us to KTVU’s Leslie Griffith. (There’s nothing that makes her stand out from the mass of bad news anchors. She just happens to be one I see fairly often.) On one hand, you’ve got her trademark fumbles and stumbles; “suspicious spires” for “suspicious fires” right off the top of tonight’s newscast, for instance. On the other, you’ve got her tendency to plow through a story with odd pauses, misplaced emphases and out-of-breath gasps — the way most people would sound if they were reading something they had never seen before in public. What does someone make for a performance like that? Well, the president of the United States makes $400,000 a year. Rumor has it that Leslie makes a quarter-million more than that, though I have to admit that despite her problems, she’s a better reader and hasn’t started a single war during her tenure. What I meant to be doing this week was doing a long, hard ride in Washington state (3.75 days, 770 miles). But my crash on the 1st and subsequent slow healing took care of that. It’s hardly the next-best or next-worst thing, but the organizers of the ride, the Cascade 1200, have a pretty neat blog going that really gives a good feel for what it’s like out there (and what it’s like out there is: hilly, very hot, and dry. “Very hot” and “dry” aren’t words we normally associate with Washington, which has a pretty solidly entrenched reputation as cool and rainy. But two-thirds of the state lie east of the Cascades, a range that effectively wrings out storms blowing in from the Pacific and Gulf of Alaska; as in California and Oregon, the mountains wall out cool marine air from reaching the interior, so the summers are hot and dry (and maybe a little more so than usual right now with a high-pressure system keeping rain out of the entire Pacific Northwest). Saturday, when I thought I’d be up near Seattle, riding down the western flank of the Cascades, I was up in the Napa Valley with my friend Pete, doing a short ride. The main event of the day occurred after we got off the bikes, though. Pete and his 6-year-old son, Niko, built a wood-fired stove in their backyard for pizza and bread-baking. A pretty amazing father-son project, the result is absolutely gorgeous. The only question was: Would it work? On Saturday, we dismantled and burned about half of an old oak wine barrel in getting the thing good and hot (nothing’s more fun than an outdoor fire, especially if you can keep it under an acre). Then Niko and Pete made some personal-size pizzas. Then we ate and ate and ate. (Pete blogged the event, complete with pictures). Uh oh. Isn’t it spelled “guv’mint”? 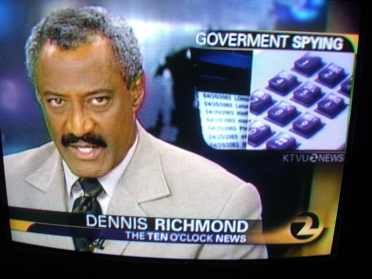 (KTVU’s “10 O’Clock News,” Friday, June 23, 2006). When we visited the area last summer, we hit the towpath along the canal a little too far to the west for it to be a reasonable walk, given my dad’s cantankerous knees. This time, we drove into a county park (McKinley Woods; among other things, the brief history posted at the park says it was a POW camp during World War II) and started walking east on the towpath. The canal runs to the north of the path, and the rivers to the south. About a mile from the McKinley Woods parking lot, after passing a little marina on the opposite bank, we came to a what appeared (to me) to be a spit of land that marked the separation of the Des Plaines and Kankakee rivers. Pictures were duly snapped and huzzahs sounded, and we walked back to the parking lot. It was only in the course of writing this, though, that I discovered to what an extent I had betrayed the legacy of Louis Joliet, the 17th century French-Canadian explorer who traveled up the Illinois River to the Des Plaines and then on to the Chicago River and Lake Michigan and quickly realized the feasibility of a canal connecting the lake to the Illinois and Mississippi. The "confluence" I located was in fact just an island in the Des Plaines River. The real merger point was west of the lot where we parked, not east. From the non-confluence of the rivers, we got on Interstate 55 south, headed for Lexington, about 70 miles away. Our destination was the cemetery in Pleasant Hill, a hamlet two or three miles outside town. My old high school English teacher, G.E. Smith, died in April and was buried there alongside his mother and stepfather. I visited Pleasant Hill once, around 1971 or ’72, when G.E. went down to check up on his family’s old home, which by then amounted to a falling-down house and a cellar with a roof on it. He was attached to the place, but it wasn’t until later that he seemed to act on the interest, writing a column in Lexington’s weekly paper about Pleasant Hill history and then becoming a serious geneaologist and trying to gather all the strands of the family that had wound up out there on the prairie. The Pleasant Hill cemetery goes back to the first half of the 19th century. The area’s first white settlers, who arrived in 1820, are buried there. It used to serve two congregations in the little town, but those churches are long gone. The grounds are unfenced and merge into the corn and soybean fields. G.E.’s grave is on an east-facing slope; his freshly cut brown-red granite stone announces his middle name, Edward, a matter that he liked to keep to himself. It describes him as "teacher, counselor, writer," and includes a quote from him: "My highest goal was always and still remains simply this: To be able to look back upon my life, from any point along the way, and be able to say that this little corner of the world that my life touched has been made better, not worse, because I touched it." When we arrived, in early afternoon, it was clear and very warm and the caretaker, Ron Eckhart, was watering new sod on G.E.’s grave from a tank on his red pickup. He’s been the caretaker for 26 years — "That’s a lot of grass cut," was how he put it — and long before that, his dad was pastor at both of the Pleasant Hill churches. Eventually he moved off to another part of the cemetery, and so did we. Up the hill from G.E.’s spot is the oldest section of the cemetery, filled with people from the days before the Illinois Central bypassed Pleasant Hill and doomed it to perpetual hamlet-hood. With only the graves to go by, you would guess life was hard there. There’s the usual large complement of children who died in their first year or two; but there are also seemed to be a lot of adults who didn’t make it out of their 30s. But maybe life was just hard everywhere when these people were trying to make farms and towns. For one example, take a look at the life of another Prairie Stater, Abraham Lincoln: His sweetheart was carried off by a fever at age 20. Just one of his four children survived to adulthood. Looking around the little cemetery, it looked like G.E., who was aged 81 years, three months and a day when he died, might be one of its oldest residents. We drove through Lexington to start the drive back toward Chicago. On the way out to Pleasant Hill, Chris had pointed out the placards on every telephone poll downtown bearing the names of local soldiers serving in Iraq, Afghanistan and elsewhere. Chris counted 19 names. The town has about 2,000 residents, so roughly 1 percent of the population is serving. We fueled up at the Freedom gas station — just $2.899 a gallon — then headed north on old U.S. 66 to Chenoa. I wanted to take U.S. 24 east to Interstate 57 both because I knew there was a Dairy Queen along the way (in Fairbury) — my dad’s favorite road-trip stop — and because I remembered a little piece of local history along the way: the Chatsworth Wreck. One-half mile north on the Toledo, Peoria & Western Railroad occurred one of the worst wrecks in American rail history. An excursion train – two engines and approximately twenty wooden coaches – from Peoria to Niagara Falls, struck a burning culvert . Of the 500 passengers about 85 perished and scores were injured. We stopped at the DQ in Fairbury, then continued on through Chatsworth to the wreck marker, which is about two and a half miles east of town, nearly on the Livingston-Ford county line. One thing that’s a little unclear when you’re at the roadside, though, is exactly where the disaster occurred. The TP&W tracks — the railroad still goes by that name — are a half mile north of the highway. I wanted to see if we could find the site of the notorious "burning culvert" — actually, a small wooden trestle. I imagined there could be a memorial or marker at the spot where the train left the tracks. We parked at an electrical substation near the railroad’s marked but unguarded level crossing. My sense, based on the marker’s placement west of the section road that runs up the county line was that the wreck site was west of the road, too. Chris and I walked along the single track until we got to a culvert maybe a quarter-mile west of the road. It’s not deep — in fact, it’s a narrow ditch that crosses under the track through an 8- or 10-foot-diameter steel pipe. The site is unprepossessing, just like every foot of track east or west of it to the horizon, and there was nothing to suggest we were at the scene of a sensational event. After we walked back to the car and started east again on 24, Chris and I spotted another culvert — this one an actual trestle — just east of the county line. We turned around and hiked out to it, too. It’s a much more satisfying place for a calamity: The tracks cross a bridge that’s about 75 feet long and a good 20 feet above a sluggish little creek. We agreed that between the two possible sites, this seemed the more likely. "The sight was most terrible. … It was too horrible to admit of description. The screams and moans of the wounded were heartrending, and the terror of the sight can not be imagined. … To add to the terror of the scene a heavy thunder and lightening storm came up, and , with heavy rain made such a scene as would appall the bravest hearts. … Even the strongest men were forced to tears as they heard and saw the anguish of the unhappy excursionists. While many displayed strong courage, grit, and heroism, others were almost frantic, and those in attendence upon them were forced to hold them to prevent acts of insanity and self-destruction." If you like the newspaper’s rendition, then you’ll love the song: "The Chatsworth Wreck." After investigating the site of the 1887 trackside carnage, we turned east again on U.S. 24. The highway crosses Interstate 57 at Gilman, then crosses Highway 1, which follows an old trapper’s trail from the Wabash River up to Chicago, at a town called Watseka. I was curious to see Watseka, which I’ve passed through exactly once: In the autumn of 1966, when Dad took us on a long-weekend trip down to the Smoky Mountains and back. I remember going through there late on a Thursday night that ended at a Holiday Inn just outside Indianapolis. As we started to get close, I asked Dad and Chris whether they remembered the big disaster that had happened in Watseka around 1970. It didn’t ring a bell with them. I recounted the big blast and fire in town — apparently some kind of gas explosion — and an image I still vividly remembered. A fireball rising far above the old-fashioned town water tower. A couple minutes later, a town came into view. There was a newish water tower rising up in the middle of town. I thought I was looking at Watseka, and said something like, "See, that must be the replacement for the old water tower." Chris was driving, and noticed the town limit sign: Crescent City. He spotted a historical marker on the left side of the road. As we passed, he asked whether we should stop. Yes, let’s. We went back, and the marker turned out to be a small pavilion with some displays. In fact, a big blowup of the picture I had described — water tower, fireball — was the centerpiece in one of the displays. 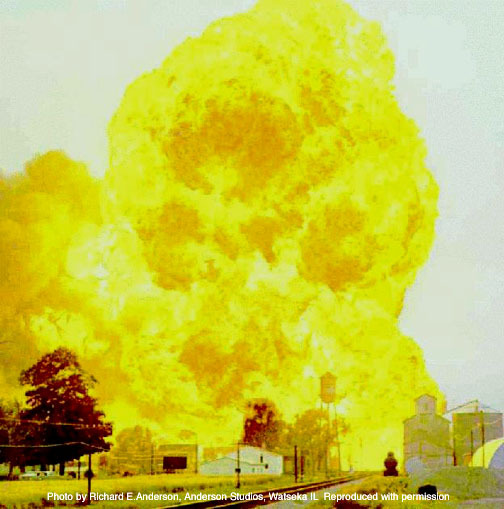 Somehow I had transferred the disaster — which occurred June 21, 1970 — to the next town over. The cataclysm involved the same railroad that ran its train off the tracks in Chatsworth in 1887, the Toledo, Peoria & Western. Several liquified propane tank cars derailed in the center of Crescent City on Father’s Day morning. The town fire department responded and fought for an hour to prevent an explosion before the first car finally went off. At that point, according to a hand-written reminiscence that’s part of the memorial, "the boys retreated and let fate take its course." Sixty-four people were hurt (mostly firefighters who suffered second- and third-degree burns), none killed; the center of Crescent City was obliterated. The president of the TP&W issued a statement accepting responsibility for the blast and apologizing for "the inconvenience." 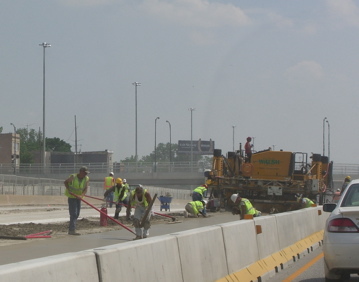 Expressway reconstruction: a rite of Chicago’s non-winter season. Chicago’s not the only place this happens, but from my outsider’s perspective, late spring/summer/fall-until-it-snows seems to be given over to large-scale highway projects. This year, the Dan Ryan Expressway on the South Side is being rebuilt. Not repaved — reconstructed from the roadbed up. The middle eight lanes — the “express” lanes, four northbound, four southbound — are torn up right now; that leaves three lanes in each direction in the main construction zone (from about 13th Street to 71st Street). Mid-afternoon Saturday, we got a nice view during our slow-but-not-horrible progress down the Ryan (towards my brother Chris’s suburban manse in far-off Tinley Park). We headed back north Saturday night just before midnight. The work was still going on (what sort of overtime and weird-shift bonuses are these highway workers making?). A quick Father’s Day trip to Chicago. I managed to arrive just at the moment Chicagoland transitions from moderate temperatures to a mini-heat wave (high today in the low to mid 90s; tomorrow, we’re supposed to have widespread thunderstorminess and temps in the low 80s; mid-70s on Monday). The main question with which I come forth to the universe today is: Why would someone take a window seat on an airliner then not look out the window? I flew out of Oakland at 6 a.m. Friday. The United flight I took used a 757, and every seat was taken. I got a middle seat in row 29. No big deal. For four hours of my life, I can accept living in a semi-reclined coffin position. My preference, though, is always the window seat. I ignore the flight attendants’ suggestion to pull down the shade so that the icabin video monitors will be glare-free during the in-flight movies and sitcoms. My in-flight entertainment is everything I can see through that little window or window and a half I can see from the coach section. Takeoffs and landings are primo, because you’re close enough to the ground to see details of the landscape or cityscape below. But everything in between is riveting, too, from the Sacramento-San Joaqin Delta to the Mississippi and Wisconsin rivers (if you approach Chicago from the northwest). Yesterday, a bleached-blonde and pink-topped and coral-fingernailed woman sat squeezed into the window seat on my right. Before we pulled away from the terminal, she was deep into a Danielle Steel novel (“Miracle,” I think it was; I read a passage in which someone named Quinn was realizing that “his life without her was a life sentence. Life without parole”). In the sliver of a view I could see beyond the book, patches of the Bay shore and the hills to the east and the Central Valley slid by). She never once glanced out the window. Of course, she could have just been nervous; she may not have wanted to be reminded how high and fast we were moving. But then: Why take the window seat? If Danielle Steel is what you want, you could pretty much ride in the cargo hold and get your money’s worth. The little bit of a view I had went away when the flight attendant made the “shut-your-shade-to-avoid-video-glare” announcement. My rowmate pulled down the shades on command and didn’t open them again until we were within about 10 minutes of our landing. That was OK — it gave me a chance to take the nap I would have missed while I stared down at the Sierra, the basin and range of Nevada, the Utah canyon country, the Rockies, the plains and sandhills of Nebraska, the Missouri River, the ethanol-producing Iowa corn country, the Mississippi, the Illinois farmlands giving way to the suburbs and expressways and O’Hare. On the radio (KWVA, the University of Oregon station): Tom Heinl, a Eugene guy. The line "a couple of Certs and then back to work" caught my attention. You can listen to it on Heinl's site (hit the MP3 link on the right). And that don't leave a lot of time for recreation. That's just enough time for my halfday vacation. That's a poor man's bloody mary. Well the alarm clock rings at 6 a.m.
Yeah there's a party at dawn and baby I'm on my halfday vacation. One last trip up to Eugene on Interstate 5. Someone asked me this morning how many times I’ve made the drive, which is about 1,030 miles round trip. Including today: Seven. At Thanksgiving, I did the trip twice in seven days, driving north on Tuesday, south on Wednesday, north and 40 percent of the way south on Sunday, and back home on Monday. But the trip might not be as long as it sounds. I mentioned Interstate 5. 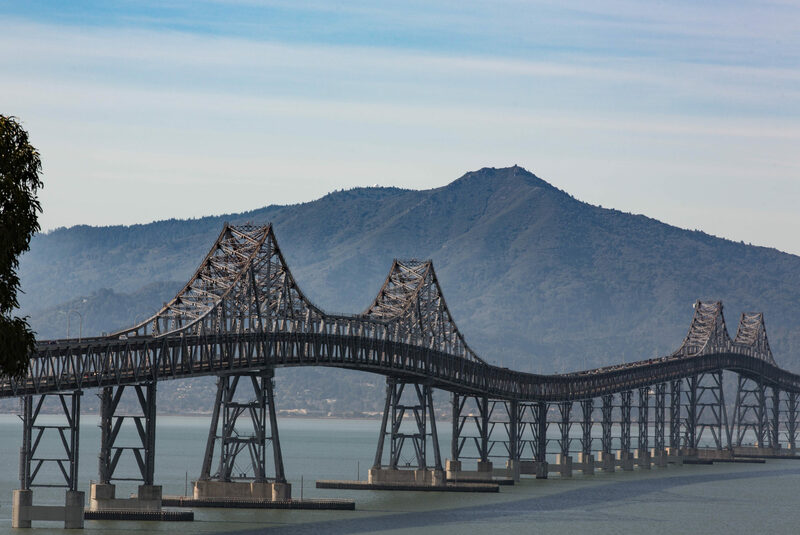 It’s not an all-out raceway as it is from the Bay Area down to Los Angeles, but it moves right along going up the Sacramento Valley and doesn’t force you to slow down (too much) once you get into the mountains in the north. That’s all by way of saying that 500 miles and change might be a seven-and-a-half or eight-hour drive if you keep your stops short. I’ll let you do the arithmetic. I’m going to bed.